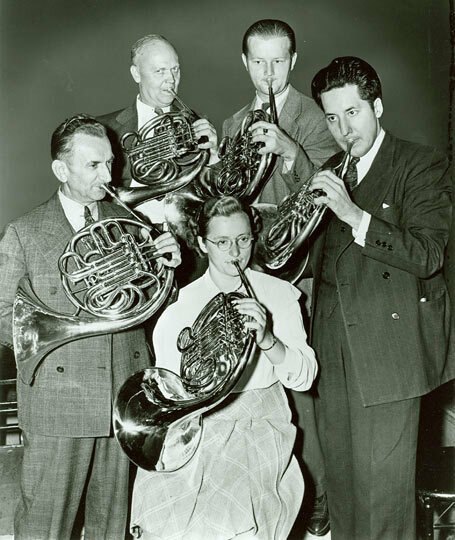 Chicago Symphony Orchestra horn section in 1941. Seated: Helen Kotas, principal. Standing (from left): Max Pottag, Frank Erickson, Joseph Mourek and William Verschoor. Hear excerpts of recordings from the Rosenthal Archives of the Chicago Symphony Orchestra featuring Kotas. 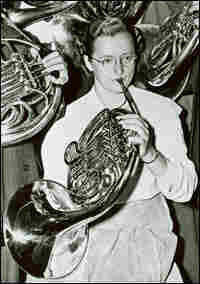 Carol Jantsch, 21, of the Philadelphia Orchestra, is the first woman to be a principal tuba player in one of the nation's top orchestras. When the Philadelphia Orchestra opens its season next week, Carol Jantsch, 21, will be anchoring its brass section. She's the orchestra's youngest member and the first woman to hold a principal tuba chair in one of the nation's top orchestras. Rejected at first as too inexperienced, Jantsch beat out 194 other tubists to win the job last winter, when she was a senior at the University of Michigan. She was given an audition after an orchestra official heard a tape of her playing. Actually, it's fitting that Jantsch is so young because the tuba, invented in the 1830s, is the youngest of the brass instruments. Renee Montagne discusses the history of the tuba with music commentator Miles Hoffman. "There are different sizes of tubas, but they all are basically just a big brass tube," Hoffman says. If you straightened one out, it could be up to 32 feet long. And they're as heavy as they look; most orchestral tubas weigh 25 to 35 pounds. "Sometimes it actually sounds heavy, and it's meant to," Hoffman says. In Igor Stravinsky's ballet Petrouchka, for example, the tuba is used to convey the image of a big dancing bear. 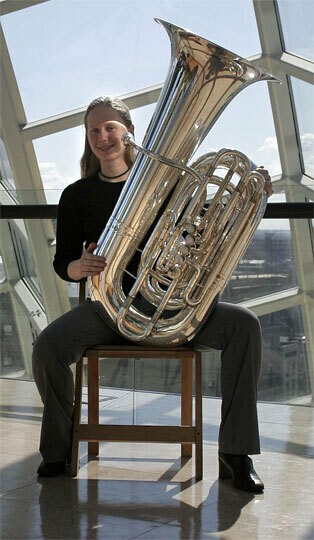 It's a misconception that a tuba's weight prevents more women from playing the instrument, Hoffman says. "When you're holding the tuba and playing it, it's the chair that you're sitting on that supports the instrument," he says. "So holding it up is not the issue. "But it requires an enormous amount of air. And frankly it's just another one of these preconceptions, like the old notion that tuba players — men or women — couldn't play fast, that the instrument couldn't be made to sound virtuosic because the instrument itself was just too unwieldy." But that perception is changing. "More and more people treat the tuba now as an instrument where anything is possible," Hoffman says. 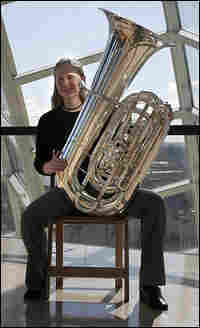 And more women are studying the tuba in conservatories around the country. The principal brass instruments of the modern symphony orchestra are the FRENCH HORN (also called HORN), TRUMPET, TROMBONE, and TUBA. Brass instruments are wind instruments, and although they may be coiled or bent into different shapes, all brass instruments consist essentially of a very long metal tube. If you straightened out all the tubing on a French horn, for example, it would be about seventeen feet long. The trumpet would be four to five and a half feet, the trombone nine to thirteen feet, and the tuba sixteen to twenty-six feet. A mouthpiece is inserted in one end of the tube; the other end of the tube flares outward and is called the "bell." All modern brass instruments use a cup-shaped mouthpiece, the specific configuration of the cup varying with each instrument. The brass player doesn't simply blow into the mouthpiece, however, he buzzes, compressing his lips and forcing air through them so that they vibrate together. The vibrations of the lips, focused and amplified by the mouthpiece and directed into the tube, cause the column of air inside the tube to vibrate, and as in all wind instruments, the vibrating air column produces the sound of the instrument. Not all brass instruments are made of brass. Many French horns, for example, are made of nickel silver, an alloy of copper, zinc, and nickel (it's silver in name and color only), and some are made of nickel bronze, an alloy of copper, tin, and nickel. (Brass itself is an alloy of copper and zinc.) Many brass instruments are silver-plated (sterling silver on brass), and some are gold-plated. The FRENCH HORN is called "French" only in English. Nobody is entirely sure why it's called French, especially since the French themselves simply call it cor ("horn"); the Italians, corno; and the Germans, Horn. A likely theory is that the English originally called the instrument the French horn (in the 1600s) for the simple reason that it came from France. And even in English, the French horn is often just called the "horn." A concerto for French horn and orchestra, for example, is called a "horn concerto"; a quintet for French horn and string quartet is a "horn quintet"; and if a musician says "I play the horn," he means that he plays the French horn. There are many horn players, in fact, who would like to see the "French" dropped altogether. (The English horn is a member of the oboe family. The immediate ancestors of the modern horn were sixteenth- and seventeenth-century hunting horns, brass hoops (with flared bells) that were played slung over the shoulder, sometimes on horseback. By the end of the seventeenth century, refined versions of the hunting horn had made their way out of the fields, off the shoulder, and into the orchestra, and by the mid-eighteenth century most orchestras included a pair of horns. It was not until the early nineteenth century, however, that horns with valves ("valve horns") were invented. Before that, all horns were "natural horns." To produce a series of different notes on a natural horn, the player must rely entirely on lip technique (overblowing) and handstopping. It's possible to change the length of the entire tube on a natural horn, but only by adding lengths of tubing called "crooks," or by switching one crook for another. The problem with adding or switching crooks is that it can't be done while playing. On valve horns, however, different crooks are built into the instrument, and the (three) valves make it possible to engage the crooks while playing, greatly expanding the range of notes available at any one time. For a variety of technical reasons, it also allows for a more consistent sound and generally more reliable pitch. Haydn's horn concerto, Mozart's four horn concertos, and Beethoven's sonata for horn and piano were all written for natural horn, although they're usually played today on valve horn. The first orchestral music calling specifically for valve horns dates from 1835, and the first important solo work for valve horn was Robert Schumann's Adagio and Allegro for horn and piano, written in 1849. Schumann also wrote a Konzertstück ( Concert Piece ) for four horns and orchestra later that same year. Other major works for solo horn include the two concertos for horn and orchestra by Richard Strauss (the first from 1883, the second from 1942), and Benjamin Britten's Serenade for tenor (voice), horn, and strings (1943). Among the chamber music works that feature the French horn, the two best known and best loved are undoubtedly the Mozart Horn Quintet (1782) and the Brahms Horn Trio (trio for horn, violin, and piano, 1865). The TRUMPET is the highest-pitched and most brilliant member of the brass family. Like early horns, early trumpets were "natural" instruments, without valves. The earliest trumpets, used as signaling or ceremonial instruments in many ancient cultures, were very natural: they were made of such things as ram's horns, ox horns, seashells, and elephant tusks. Metal trumpets (silver, bronze, brass) of the Middle Ages were generally long straight tubes with flared bells; it wasn't until the fifteenth century that instrument makers learned to bend brass tubes, which allowed them to make the instruments more compact. The first bent trumpets were in the shape of a flattened S-curve, but they were soon made obsolete by trumpets whose tubing was fashioned into an elongated oval coil. Instrument makers of the time also invented a trumpet with a sliding, telescoping tube extension. This "slide trumpet" survived in specialized roles for several centuries, but it's mainly remembered now as the precursor of the trombone. With various modifications, the oval coil has remained the basic shape of the trumpet to this day. Throughout the Middle Ages (pre-1430) and Renaissance (ca. 1430-1600), trumpets retained their traditional military and ceremonial functions: they were used mainly for signals and fanfares. In the 1600s, however, opera composers began including trumpets among the instruments of the orchestra, where they were often paired with kettledrums (timpani) to provide festive or martial effects. Trumpet players during the Baroque period (ca. 1600-1750) also developed a type of extremely high, melodic solo playing called clarino style. J. S. Bach's Second Brandenburg Concerto (ca. 1721) includes a part for solo trumpet in this style. Clarino playing, which demanded a very specialized, virtuoso technique, began to disappear as the Baroque waned, however, and by the time of Haydn and Mozart it was already considered something of a lost art. (When modern trumpeters play the Second Brandenburg Concerto they use different instruments from the kind used in Bach's day, and the technique is not the same as that required for the original clarino style.) During the Classical era (ca. 1775-1820), composers employed trumpets mainly to add brilliance and power to the orchestra, usually in the traditional combination with timpani. Two important solo works nonetheless date from the Classical era: Joseph Haydn's Concerto in E-flat for trumpet and orchestra (1796) and Johann Nepomuk Hummel's Concerto, also in E-flat (1803). The new technology of the early 1800s that produced the valve horn also made possible the valve trumpet. As on the horn, the valves (usually either two or three) provided added range and reliability. With the availability of greatly improved instruments -- and players who had learned to use them -- orchestral composers of the nineteenth century began to exploit the melodic potential and expressive range of the trumpet much more extensively. Twentieth-century orchestral composers certainly followed suit, but despite all the interesting, intricate, and even intimate music that's been written for trumpet over the last century and a half, the trumpet has never lost its age-old character as a signaling instrument, an instrument that can call people to attention in a powerful and dramatic way. The TROMBONE (also sometimes called SLIDE TROMBONE ) has remained largely unchanged for over five centuries. Trombone is Italian for "big trumpet": instrument makers in the fifteenth century created the trombone as a bigger, lower-pitched, and improved version of the slide trumpet. Up until the eighteenth century, the lovely English name for trombone was sackbut, a word of Old French or possibly Spanish derivation. During the Renaissance, musicians played the trombone in town bands, royal ceremonial bands, and in mixed ensembles with string and keyboard instruments and voices. At the time, the trombone was a more refined instrument than either the trumpet or the horn. It was better suited for blending with other instruments and voices, and because of the slide, better able to play real melodies, as opposed to simple fanfares. The trombone was also used in Renaissance church music, usually to reinforce lower voice parts; later, during the Baroque period, Handel and Bach occasionally used it for the same purpose. It was not until the late 1700s that the trombone was employed in the opera orchestra with any regularity, and then its primary function was to evoke feelings of awe in scenes involving the spiritual or the supernatural. Mozart used trombones for this purpose in his operas The Magic Flute and Don Giovanni, and he included a prominent trombone solo in his Requiem. Beethoven was the first to include trombones in symphonic music, introducing them to great dramatic effect in the last movement of his Fifth Symphony (1808). The trombones have been regular members of the orchestra since. Trombones come in various sizes. The standard orchestral trombone is known as the tenor trombone. Much orchestral music of the nineteenth and twentieth centuries also calls for bass trombone, but since the true bass trombone is a very long, very unwieldy instrument, most bass trombone parts are played today on a hybrid instrument called the tenor-bass trombone. The tenor-bass trombone is approximately the size of a tenor trombone, but for notes in the low register -- the bass trombone register -- it has an extra length of coiled tubing that can be engaged by pressing a valve. There are relatively few solo compositions for trombone, and the trombone is rarely featured in chamber music, although the French composer Francis Poulenc wrote an excellent trio for trombone, trumpet, and horn (1922). The TUBA is the biggest, heaviest, widest, and lowest-pitched of the brass instruments, the true bass of the family. It's also by far the youngest member. It was invented in Germany in the 1830s and has never been a "natural" instrument -- it has always had valves. Like the trombone, the tuba comes in several different sizes. The size most commonly used in the orchestra is called the contrabass-tuba, or double-bass tuba. Solo opportunities for tuba players outside the orchestra are few, although the English composer Ralph (pronounced "Rafe") Vaughan Williams wrote a fine concerto for tuba and orchestra (1954). It's not surprising, in view of his many innovations in orchestral instrumentation and sonority, that Hector Berlioz (1803-1869) was the first important composer to write for the tuba. Although the chamber music repertoire for brass instruments in combination with other types of instruments is not extensive, there is a large and very interesting repertoire of music for brass quintet. Some of this music is original, but much of it is music that was written for other instrumental combinations and later arranged for brass quintet. A brass quintet consists of two trumpets, horn, trombone, and tuba. 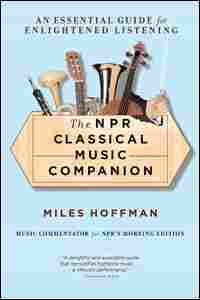 From The NPR Classical Music Companion by Miles Hoffman, copyright © 1997 by Miles Hoffman and National Public Radio. All rights reserved.